Laurie began training in karate in 2004. Previously, she had not experienced any significant knee problems. Unfortunately, only one month into her karate training experience as a White Belt, Laurie tore her right anterior cruciate ligament (ACL). She immediately sought out physical therapy treatment at Blaser Physical Therapy to maintain her strength and function to the best of her ability. She scheduled her reconstruction but continued to progress to her Yellow Belt preoperatively. However, her functional abilities were severely limited. She was unable to go up and down stairs, perform any of her leg exercises at the gym, or walk for any significant distance. Even her normal walking pattern now exhibited a prominent limp. Following her ACL reconstruction, Laurie returned immediately to Blaser Physical Therapy for her rehabilitation. An individualized program was created for her following her surgeon’s protocol for treatment. She worked closely with her physical therapist who challenged her into her next phases of rehab as she was able to tolerate higher level activities. Although Laurie had not been a jogger prior to her injury, she began to include jogging as part of her exercise routine following her rehabilitation. Laurie says that she never had the strength and stability prior to her injury that she had following her rehabilitation at Blaser Physical Therapy. 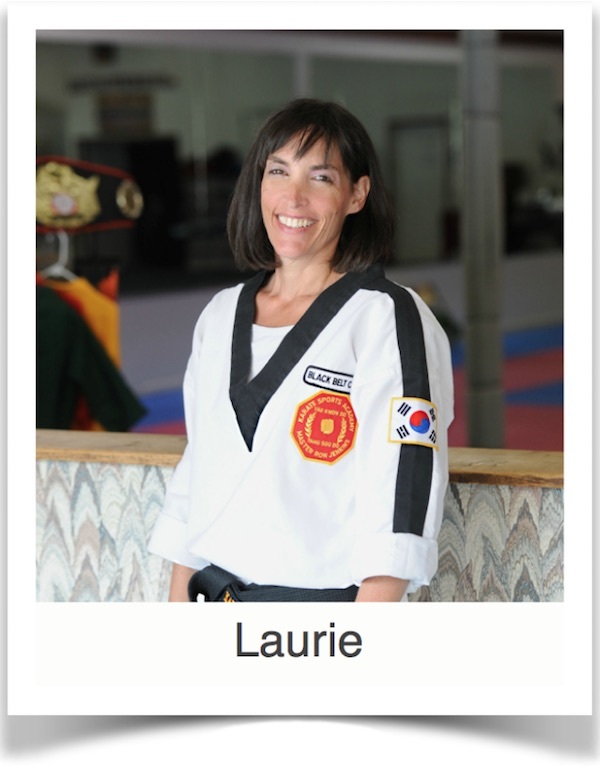 She continued to progress through her karate levels when as a Blue Belt, Laurie tore her left ACL. She quickly returned to physical therapy to maximize her quadriceps strength as she remembered how quickly she lost strength in her quads following her previous ACL tear. Again, she underwent ACL reconstruction and followed up with Blaser Physical Therapy for her post op rehab. Again, she finished with return to full activity, including karate and running. Unfortunately, four days prior to testing for her Red Belt, Laurie tore her right medial meniscus. More determined than ever, Laurie participated in physical therapy in order to successfully complete her Red Belt test before she underwent more surgery to address her torn meniscus and engage in yet another term of physical therapy. Ironically in 2012, Laurie sustained a progressive tear of her left medial meniscus and repeated her routine of surgery and rehabilitation. Now, Laurie declares that her knees are stronger than ever. She was determined not to put off testing for her Black Belt until after her surgery. Amazingly she successfully tested for her Black Belt three weeks prior to undergoing her next medial meniscus arthroscopy. Laurie is proud to report she feels great; no problems, no swelling, no pain, no braces required. Furthermore, she is happily participating in the activities she loves including running, yoga, karate, spin and body pump classes.